We are thrilled to be asked to provide our brand of content that is The Vintage Collective Markets to this Inaugural event. This is an outdoor event held at Elsie Austin Oval Mount Helena. Proudly brought to you by the Mount Helena Residents and Ratepayers Progress Association (Inc). 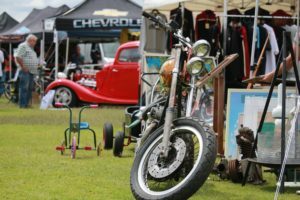 VCMPERTH Events present a Vintage themed Market, and as such we give preference and priority to Vendors showcasing vintage, up-cycled, remade, reclaimed, recycled and vintage-style wares or services. Pinup Pretties to vintage rides of all types. All business types are welcome, from mum and dad to established Rockabilly retailers and services, not limited to barbers, body panel and paint, publishers, artists, performance clubs and automotive stores and so forth. Stall space is limited. All Wheel Show’n’Shine, Pretty as a Pinup Parade will feature as well as our markets. Mount Helena a historic saw milling village in the picturesque Perth hills, hosting the inaugural Hills Billy Cart Festival. The main feature of this event is a race of Billy Carts along the main Street supported by a host of vintage themed attractions. This is an event for all the family, for young and old. It will be a day for creating happy memories – bring the whole family along and experience pure nostalgia in this glorious, historic hills timber milling village. This event is not possible if not for the vision and hard work of the Mount Helena Residents and Ratepayers Progress Association (Inc). We thank John and Gwyn for inviting us to participate. Be a participant in the Billy Cart race, dress in period costume, bring your old car or bike along or just come and visit the vintage markets. BOOK your vendor opportunity now! Spaces won’t last long!